I was recently contacted by Maple Holistics to ask if I'd be interested in sharing their products with you lovely lot in the form of a couple of reviews as well as a giveaway! After a quick browse of their range I was super-keen to say yes; Maple Holistics are an American brand focussing on providing natural, premium products to enhance health, hygiene and daily living, using high-quality and pure ingredients to make each product as effective as possible. One of the products I was intrigued by was their Degrease Shampoo*; struggling as I do with an extremely oily scalp, I've been on the hunt for an SLS-free shampoo which will effectively clean my hair for the last few years. Maple Holistics Degrease Shampoo boasts a range of ingredients, targeted to help treat oily, itchy scalps; Lemon cleans gently without stripping and offers antibacterial properties • Rosemary helps to stimulate cell renewal • Cypress has astringent qualities to help balance sebum production • Basil stimulates the hair follicles to restore and strengthen brittle or thinning hair • Jojoba and Peach Kernel Oils condition and moisturise sensitive scalps to treat dandruff and hair loss • and Botanical Keratin helps replenish the hair's natural proteins. But how have I been getting on? Well... the shampoo is easy to use, lathering in my hair without any problems, which is always nice to see with an SLS-free product; I know lather isn't strictly necessary to clean, but it's what we're used to, and it does make it easier to spread product through the hair in my experience. I've found a little goes a long way with this shampoo, meaning the bottle should easily last me a couple of months despite not being huge and me having a lot of hair! I always shampoo twice, once to remove any oil and product build-up and then again to ensure my scalp is properly cleaned; the scent of this shampoo as I massage it into my scalp is quite herbal and not one I'd choose, but it isn't unpleasant or off-putting. Once rinsed out, my hair feels clean, but with that feeling where you know you're in trouble if you don't use conditioner; I've just been using my usual conditioner on the bottom six inches or so of my hair, as usual. I never blow-dry my hair anymore (I think the last time I used my hairdryer was at Christmas) but once my hair has dried naturally, it feels soft, clean and silky. Typically I wash my hair every other day but am heavily reliant on dry shampoo to look presentable on the second day; if I had a big event or a job interview or something, I probably wouldn't go with second-day hair! 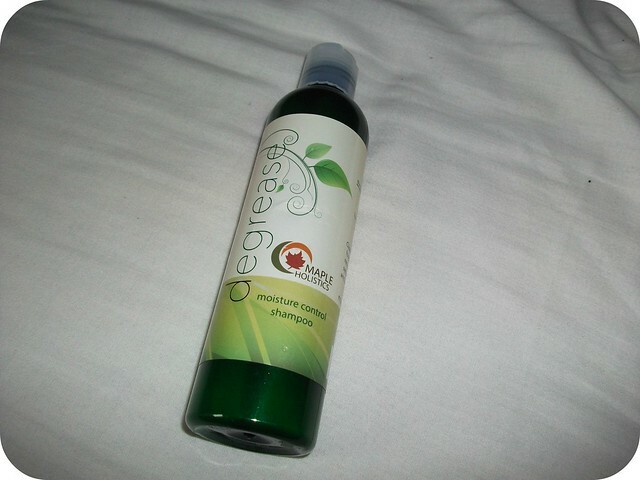 I've found that on day one of washing with Maple Holistics Degrease Shampoo (i.e. I wash it in the morning and for the rest of that day) my hair is lovely and fresh; by day two, I still need a good dry shampoo to freshen up and absorb excess oil at the roots. This is by no means unusual and I've yet to discover a shampoo that can help my hair last longer than a day! 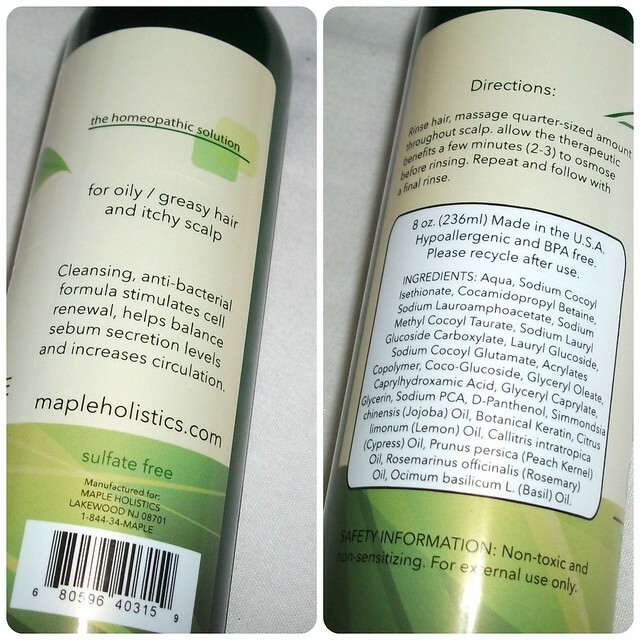 Maple Holistics Degrease Shampoo is priced at $16.95 for 8oz, which is around 200ml, available here. 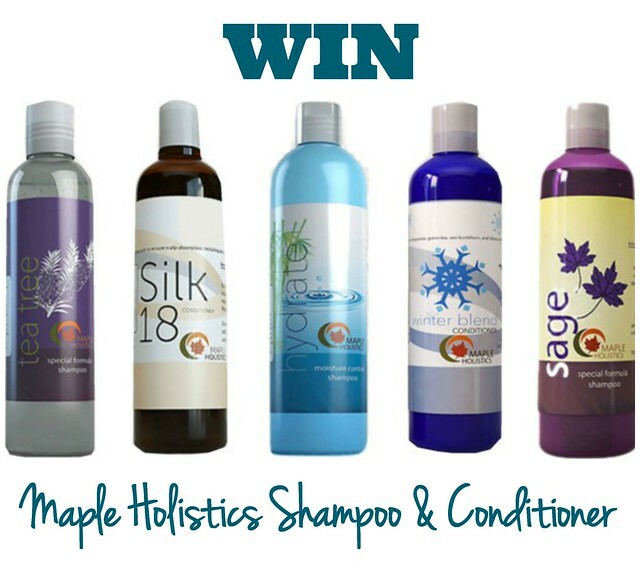 Maple Holistics have very kindly offered me the opportunity to partake in their #SummerofGiveaways and give away a shampoo and conditioner duo of your choice from their range, which you can see on their website. Please use the Rafflecopter widget below to enter, and make sure to enter the details it asks for as I will be moderating entries and removing any which I can't validate! This is open to residents of the UK, USA and Canada only - sorry to readers in other countries. The only compulsory entry is to leave an email address, which will only be used to contact the winner - all other entries are entirely optional, but the more you fulfil, the greater your chances of winning. If you're under the age of 16, please make sure you have your parent or guardian's permission to enter as we will require the postal address of the winner in order to ship the prize. The prize will be shipped directly by Maple Holistics and I bear no responsibility for this. You have until midnight on the 28th September to enter - that's two weeks from now. Good luck folks! I'd love to try the Winter Blend Shampoo and Conditioner! Sounds like a great shampoo, I think the one to help control oil would be amazing to try! The tea tree shampoo & argan oil conditioner! This sounds really good! I'm always on the lookout for a new 'clarifying' shampoo, especially since I'm guilty of using a blow-dryer every time I wash my hair! I'd like to try the colour safe dandruff shampoo and conditioner.